Our first trip to the islands was one of our best trips yet. We fell in love with Hawaii and will return often! Montana, our teenage daughter (my step daughter), loves to go to camp for the majority of the summer. Sometimes I wish she didn't, as we miss her, but she loves it! This gives us some time to get in a romantic holiday and come up with some great vacation ideas. 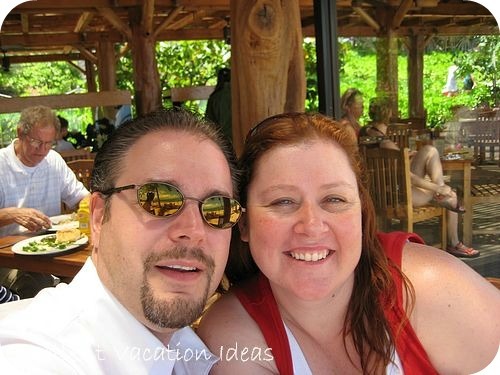 In the summer of 2007, we wanted to do something different, a cruise most likely with Norwegian Cruise Lines, as they have become our favorite cruise line. We decided we wanted to do something different, and our choices come down to Hawaii or Alaska. I had never really wanted to go to Hawaii. It had never been a place I was interested in. I had visions of tacky touristy things and over the top commercialism. Don't get me wrong I like commercialism at times, but we really wanted to see beauty, have some adventures, and relax. We were set to go to Alaska (one of our dream trips) when we realized that it would be a little cool there. Wearing jeans and coats etc. didn't appeal to us that summer. So our Hawaii adventure won! 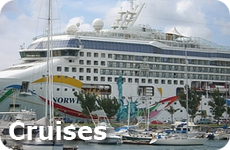 We worked our Hawaii Adventure around the cruise on the Pride of Hawaii (unfortunately she is no longer in servicei and has been re-commissioned as the Norwegian Jade), as we thought this would be the best and most economical way to get a taste of the islands. It really did the trick. I spent most of July planning our trip. I researched hotels, itineraries, shore excursions, "must see's", and "what not to miss's". It was lots of fun to plan it! I ended up with a day by day itinerary in a tropical looking duo tang, that we took with us to make sure we had all the documentation and information we needed. Warren enjoyed ribbing me about how organized I was. After the cruise we had 5 nights in Kona, on the Big Island, where we rented a Villa and continued our Hawaii adventure by taking a Helicopter Tour over the Volcano and the rest of the Big Island, and did the trek to the Observatories at the top of Mauna Kea. I can honestly say this was one of our favorite vacations! We got a taste of the 4 large islands, had a romantic vacation, had a Hawaii adventure and enjoyed the beauty. These islands were not what I expected in the least. 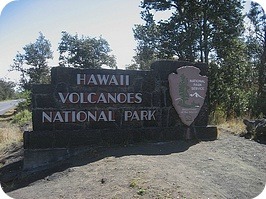 It was beautiful, and we loved it so much we are returned for a family Hawaii vacation with Montana in summer of 2008! 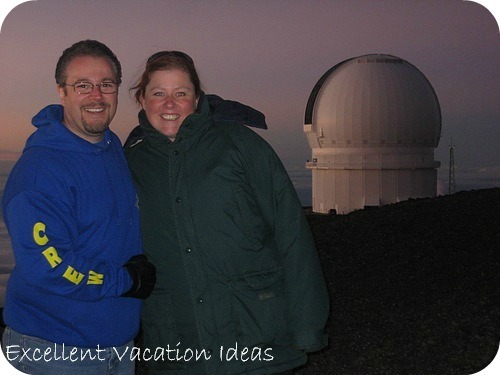 It was one of our best vacation ideas ever! When we arrived after a 10 hour flight (12 hours travel time - from Toronto, through Chicago), we rented our car from Thrifty Car Rental . We had heard that they were good and if you joined their Blue Chip Program, you would be able to pick up your car easily by using a special desk. Since we knew that we were going to rent many cars in different places, we thought this would be a great idea. Warren went and picked up the car, then picked me up from terminal (great idea if you don't want to lug bags on the car rental buses). We ordered a convertible PT Cruiser but they didn't have any available - NOTE: convertibles are fun but if you have lots of luggage (we had 3 pieces and 2 carry on bags with wheels) - you will be putting luggage in the back seat. With map in hand (that I had prepared before) we hit the road to Waikiki. Well I wouldn't say it was an easy drive. We arrived into Honolulu at about 4:00 pm on a Friday afternoon. We were shocked by the traffic. It wasn't the paradise we had expected! This was an interesting start to our Hawaii adventure! I had researched it previously, however I had failed to tell Warren - he was more shocked then me - so tell your party what to expect or they will be shocked too! We navigated our way to the Royal Hawaiian Hotel. We chose the Royal Hawaiian Hotel as it was riddled with history and we could use our Sheraton Points (travel tip - use credit cards that have hotel points - we used cash and points so only paid about $60 a night plus so many points). 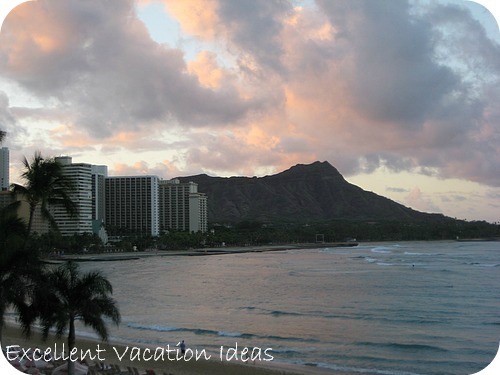 We stayed in a Royal Ocean Room (beautiful and quite historic but no balcony) and then moved to a Tower Ocean Room as I really wanted a balcony to sit on and watch the going's on on Waikiki Beach. This was one of my favorite things to do first thing in the morning (we were up at 5-6 am each day due to the 6 hour time change), watch the surfers in the water. There would be hundreds of them just sitting there waiting for the next wave. I was amazed at their determination. First night went to the Ala Moana Shopping Center to get a prepaid cell phone to call home with and get some dinner. The jet lag hit us quite bad that night so we decided to go to bed early. 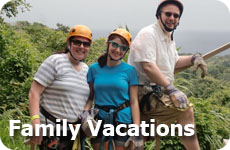 Kauai offers so much for either a relaxing or an active vacation. 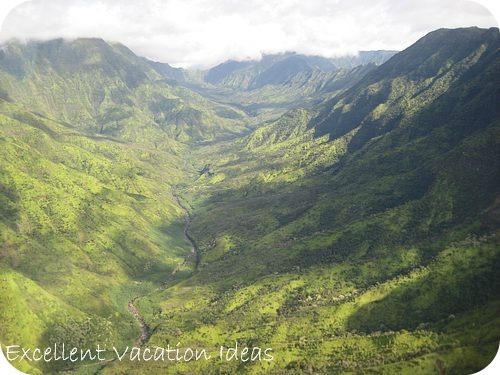 From the incredible beaches to the adventure of the Na Pali Coast.